Before a diamond can be deemed suitable for purchasing, the diamonds are put through extensive tests to determine that it’s authentic prior to receiving a grading certificate. There are several things a diamond will be graded on, including cut, clarity, color and carat weight. The following guide aims to explain what each of these mean as well as the importance behind diamond grading. And diamond price depends on how relatively rare is the color, clarity, size of the diamond. When choosing a diamond many often use carat weight as a refernce point to describe the size of the stone, yet it's important to understand that cut and shape affect the appearance of the diamond just as much. Two stones of same weight may easily appear different in size when viewed from above, which is how the engagement ring is typically viewed. Flatter cuts will make a diamond appear larger when viewed from top yet at the expense of brilliance and other important valuable aesthetic factors. 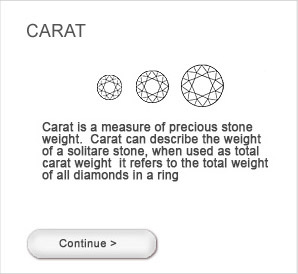 So even though carat weight usually translates to approximate size equivalents, the actual appearance depends on how the diamond is proportioned. It's important to remember that stones of same weight vary widely in actual size. - If you are looking for a diamond that offers fantastic brilliance and fire, one of the top cuts is the round diamond. The round diamond is one of the more popular cuts and sometimes referred to as an “ideal cut”. For many couples looking to tie the knot, the round cut encompasses beauty and is usually the perfect cut for engagement and wedding rings. The round cut diamond offers unsurpassed brilliance and sparkle provided that it is cut to certain specifications. 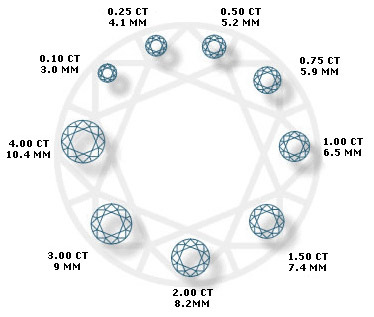 There are many specific proportions that diamond dealers look for when selling round diamond cuts; for example, the diamond should use the Towlkowsky ideal cut method, which follows certain mathematical principles to shape the diamond ideally. Following the Towlskowsky ideal cut, the diameter of a premium round cut method should be between 52.4 to 57.5 percent, the girdle thickness should be between thin and thick, the pavilion should be 42.2% and 43.8% and the crown angle should be 33.7% and 35.8%Diamond companies will usually indicate that their diamonds are ideally cut when the measurements and specifications are within the ideal range set forth by the Towlkowsky method, or at least very close to it.Round cuts are highly popular in the consumer market and are used as a center stone and side stones in rings as well as on other types of fine jewelry. As always, make sure you inspect the diamond closely or ask for an independent appraisal to determine the quality of the stone and the retail or wholesale value of it. - For any woman looking to enjoy the beauty of diamonds, but rather have pieces that are for the most part understated and subtle, one of the more interesting diamond cuts that you should look into is the Emerald cut diamond. One of the reasons that the Emerald cut diamond is perfect for very subtle beauty is that the emerald cut diamond reflects less light than the standard brilliant cuts, as well as it is usually rectangular in shape. However, If you prefer a more squarish cut, you can still find antique pieces that display these shapeful characteristics.One of the ways to enhance a beautiful emerald cut diamond is to pair it up with side stones. The reason paired stones are perfect for the emerald cut is that the edges on an emerald cut diamond usually allow for a variety of stones to be placed alongside.While you can find beautifully cut emerald diamonds all over the world, one of the most beautiful emerald cut diamonds come from Israel. New York and Antwerp are also known to produce well cut emerald diamonds. 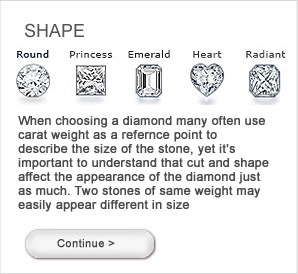 When choosing an emerald cut diamond, one of the most important priorities to look for is the quality of the diamond. It is important to note that every diamond is not a candidate for an emerald cut; it takes a special diamond, one that is very high quality and is shaped a specific way to be eligible for an emerald cut. Any imperfection or inclusion can be visible when a diamond is cut into the emerald shape. If you are interested in diamond jewelry that is subtle and understated, take a look at the emerald cut diamond. - One of the more recent diamond cuts and proving to be incredibly popular cuts of the last few decades is the princess cut diamond. The princess cut diamond has grown in popularity due to its wonderful characteristics of both style and brilliance. If you prefer jewelry that is unique as well as beautiful, the princess diamond cut should definitely receive your attention. Created during the 1980’s, the princess cut diamond reflects light brilliantly and is typically cut perfectly square. The corners of the diamond are sharp and uncut. Compared to a round diamond, the princess cut can offer much more brilliance and fire. A skilled diamond cutter can make a diamond into a perfectly proportioned princess cut, which is a perfect-sided square. The reason the princess diamond cut is a favorite among diamond lovers is that gives the wearer the best of both world. Not only does the princess diamond cut look unique as well as stands out in a crowd, it also reflects light nicely to offer high brilliance and fire.The princess diamond cut is easily one of the most popular cuts throughout the United States. It is also growing in popularity throughout Europe and the world. Before buying a princess cut diamond, educate yourself on the nuances of this cut. Potential diamond buyers should avoid princess cuts that are too flat or deep. It is important to note if the sides are even and watch out for a thin or very thin girdle. Having too thin of a girdle can make it more prone to chipping. And of course, choose a princess diamond cut that has a lot of brilliance and spark avoiding dull, lifeless cuts. - One of the diamond cuts that is growing in popularity over the last several decades is the oval cut diamond. Created by Lazare Kaplan during the early 1960’s, the oval cut diamond is a modified version of the round brilliant cut. For people that are looking for characteristics similar to the round “ideal cut”, but would like a diamond that is more unique to fit their style and tastes, the oval cut diamond is an excellent choice. The oval cut diamond is configured similarly to the round cut. There are 56 facets that are typical for oval diamonds, but since there are no exact methods or measurements, just like with the marquise cut diamond, your personal shape preference should be the determining factor for what you consider the best shape for an oval cut diamond to be.If you are looking for more direction than just personal preference, a high quality oval cut diamond should have a length to width ratio of 1.5:1. If the oval cut diamond’s ratio is greater than 1.5:1, you will probably notice an undesirable effect called the bow-tie. The bow-tie effect is when a bow-tie shaped dark area on the oval cut diamond occurs usually as the result of improperly cut angles. The oval cut diamond should also have an elliptical shape when viewed from the top of the diamond. The oval diamond is becoming increasingly popular as a center stone for engagement rings and wedding rings, but can also be found in a wide range of high quality jewelry. Typical oval cut diamonds reflect light brilliantly and are usually at their best when there is no color at all. As with all fancy shapes, potential buyers should look at the overall clarity and color of the stone. The clarity and color is much more important to the oval cut diamond than the round cut diamond because impurity and inclusions can be much easier to spot. If you are looking for a diamond cut that is similar to the round cut diamond’s characteristics but still is unique in shape, the oval cut diamond should be extremely appealing. - If you love the brilliance and fire of the round cut diamond (ideal cut), but would like to choose a unique shape that goes well with your style and sensibilities, one of the more interesting diamond cuts that you should look into is the pear shaped cut diamond. The pear cut diamond is a modification of the traditional and extremely popular round cut. Beyond the unique and obvious beauty of the pear cut diamond, the cut also offers the owner fantastic brilliance and sparkle similar in characteristic to the round cut diamond.The pear cut diamond is probably the most subjective cuts. The fact is that much more than the marquise or oval cut diamond, the shape and size of the pear cut diamond is completely a matter of personal taste.Pear cut diamonds can be used in a wide range of jewelry, including necklaces, earrings, rings and various custom designs. However engagement and wedding rings are still the most popular jewelry items that exhibit the pear cut. The pear cut typically contains 58 facets, allowing light to pass through it and sparkle wonderfully.If you are interested in the pear cut diamond, one of the of the factors you should consider when purchasing a pear cut diamond is the overall impression that the cut makes, including various aspects such as size, shape and clarity. The pear cut is obviously different in cut compared to the marquise cut, however they both are prone to undesirable traits including the bow-tie effect. The bow-tie effect is when a bow-tie shaped dark area on the pear or marquise cut diamond occurs, usually as the result of improperly cut angles As with the marquise diamond, a bow tie effect is often inherent in the design of the pear cut, but shouldn’t be a problem provided it isn’t too dark or large. If you are looking for a unique and fancy cut diamond, one of the most unique cuts to choose from is the heart cut diamond. The heart cut diamond is a great way to distinguish your diamond from other popular cuts and still add beautiful brilliance and fire to your diamond. Similar to most fancy cut diamonds, the heart shaped diamond cut is modified from the traditional round cut or sometimes referred to as the ideal cut diamond. The heart cut diamond usually contains 59 facets. One of the benefits of owning the heart diamond cut is that this cut offers its owner an alternative to the tradition oval or round cuts.Many heart cuts are used in necklaces as well as rings and matching earrings. Unlike most cuts of diamonds, heart cuts are not as popular for engagement and wedding rings, they are usually given for less formal occasions such as birthday’s, anniversaries and of course Valentines Day.While the popularity of the heart shaped cut is typically reserved for the wealthier markets due to most people forgoing a huge expense for less formal occasions, more heart cut diamonds of varying qualities are becoming more abundant in the general retail markets.When purchasing a heart shaped cut diamond it is important to check the overall quality of the diamond including how it is cut, the color and clarity. It is also a good idea to avoid heart cut diamonds that are too flat. A flat cut diamond will dull the brilliance of the stone making it less desirable. If you are in the market for a unique, fancy cut diamond, heart cut diamonds are a great way to benefit from a diamond that has brilliance and fire as well as a unique cut. - While many people aren’t familiar with Asscher cut diamonds, it has become increasingly popular over the last few years primarily due to the fact that it has been featured as fine jewelry in top rated television shows and has been the choice diamond cut for many of Hollywood’s elite. If you are interested in purchasing a relatively unknown, yet beautiful cut, here are some tips. The Asscher cut diamond can usually be characterized as a square emerald cut. Because the cut is extremely fancy and unique, it doesn’t really have a strict definition, but many experts in the diamond industry consider the Asscher cut diamond to be the forerunner to the emerald cut.Asscher cut diamonds was created around the early 1900’s. These Asscher diamonds were cut into a square with sharp, cut corners. It is important to note that there are no typical proportions for the Asscher cut diamond because they are not very common. In fact, original Asscher cut diamonds are very rare and not usually found in the retail market.If you are a buyer interested in purchasing an original Asscher cut diamond, you should be advised that they are more commonly found at estate sales and antique stores. However, since the popularity of the Asscher cut diamond has grown these last few years, more and more diamond companies are creating the Asscher cut diamonds for their clients. Asscher cut diamonds do not usually come cheap, due to the fact that very large stones are usually the best stones for this specific shape. It is not uncommon to find an Asscher cut diamond upwards of 6 carats.Cushion Cut If you are looking for a unique, fancy cut diamond that has been around for more than a century, one of the more interesting diamond cuts that are available is called the cushion cut diamond. The cushion cut diamond is sometimes referred to as a pillow cut diamond or even generically termed “old mine cut” by diamond companies before the turn of the last century. Typically, the cushion cut diamond is in the shape of a square or squarish-rectangular. The cut usually resembles the shape of a pillow, hence the name. You can choose the exact shape of your cushion cut diamond by its ratio. For instance, diamonds cut to a ratio of 1:1 are more square, diamonds cut to a ratio greater than 1:1.15 are more rectangular in shape.Cushion cut diamonds have rounded corners surrounding a large facet. It is important to make sure that the color and clarity are high quality, due to the fact that any inclusions or imperfections will be easily noticed. It is also a good idea to look for stones that are symmetrical in shape. Generally cushion cut diamonds are popular in matching sets and as center stones in rings; however a cushion cut diamond will complement almost any piece of jewelry. An important note is that older stones will reflect light in a different pattern than newer cushion cuts will, so keep that in mind when shopping. If you are looking for a fancy and unique cut of diamond that employs a large facet, squarish design and soft rounded edges, look into the cushion cut diamond. - Radiant cut diamonds come in a wonderful fancy cut diamond shape. While not as popular as the other fancy cut diamonds, radiant cut diamonds are adored by many diamond connoisseurs. 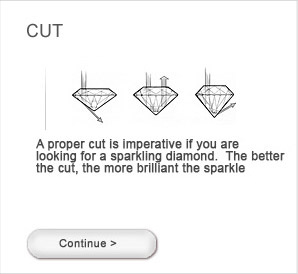 Here are some tips on purchasing a radiant cut diamond. A radiant cut diamond is a squarish cut diamond that is characterized by trimmed corners. The radiant cut diamond is an extremely versatile cut diamond that can be set in many different ways, however it is usually the centerpiece, with beautiful baguette or round side diamonds complimenting it.While the radiant cut diamond is usually cut to be squarish at about 1:1.05, there are degrees of rectangularity that it may employ. For instance, a ratio of 1:1.1 or 1:1.2 is not uncommon and it is really up to the purchaser to determine what exact shape is preferred.Due to its large facet, it is important to consider a stone that has a great color and clarity rating. Like other similar cuts, the radiant cut diamond will show inclusions and imperfections very easily so make sure the stone is of the right quality before purchasing. Radiant cut diamonds are great for engagement rings and wedding rings, as well as other high quality jewelry. If you are unsure of how to rate a radiant cut diamond, it is always advised that you have an independent diamond appraiser appraise the diamond to determine it value. If you are interested in squarish or rectangular diamond cuts, you might also want to consider the cushion cut diamond, emerald cut diamond and the Asscher cut diamond. If you are looking for a diamond cut that will stand out in the crowd and be easily noticed, consider the marquise cut diamond. The marquise cut diamond is considered a fancy shape by most standards and buyers. The marquise cut diamond can be characterized as a boat shaped brilliant stone. Actually, the marquise cut diamond does not have a set standard on how the diamond should be cut. It is truly up to personal preference and the shape and size of the stone. Marquise cut diamonds are usually sold as center diamonds for engagement rings and wedding rings. Because of its unique shape it usually demands to be the center of attention.While the marquise diamond cut is still extremely popular, it has begun to lose ground against a similar cut diamond which is the oval cut. However for many diamond lovers, the marquise cut diamond is still considered one of world’s classic diamond cuts and like all classic styling is well regarded throughout the times.When choosing a marquise diamond, it extremely important to note the overall clarity and color of the diamond. Due to the shape of the marquise cut diamond, the color and clarity will be more apparent. Unlike round cut diamonds that are less noticeable when it comes to color and clarity, a marquise cut diamond’s color and clarity should be of very high quality standards in regards to its color and clarity.Another important consideration is to make sure the angles of the diamond have been properly cut to avoid a “bow tie effect”. The bow-tie effect is when a bow-tie shaped dark area on the diamond occurs, usually as the result of improperly cut angles. If you are looking for an extremely fancy cut diamond that is sure to please, choose the marquise cut diamond. If you are interested in what makes a great looking diamond, it is important to consider the depth of the stone. Depending on the cut of the stone, the depth can vary. Depth not only can give the illusion of a bigger stone on a ring, the depth of the stone can also determine the amount of light that is reflected back to the eye. Here are some tips. For many people buying a diamond, a larger surface area is an attractive way to give the illusion that the stone is much bigger than reality. Diamonds are extremely expensive and if a buyer can save a few thousand dollars while still getting a stone with lots of surface area, it might seem like a good idea. It is important to note, however, that the way a diamond is cut, and specifically the depth of the diamond will determine the amount of light that is reflected back to the viewer’s eye. Too shallow a stone and the light will pass through it, too deep of a stone and the light is lost as well. If you want to get the most out of your diamond, the depth of the stone in the relation to the diameter should be 59.3%. One of the most popular diamond cuts is the Tolkowsky’s cut. The Tolkowsky’s cut will reflect light optimally from the stone to show its brilliance. The Tolkowsky’s cut makes the depth of the stone 59.3% of the entire diameter of the stone. There are mathematical equations to figure out the depth and degree of your stone, but when purchasing a stone, you can talk about the depth of the stone with the jeweler. Most diamonds are cut to specific dimensions and your jeweler can discuss the specific cut your diamond has. However, if you are planning on purchasing a diamond, it is important to note that the depth of the diamond does affect its reflective qualities. A table is probably the most important part of a diamonds cut. 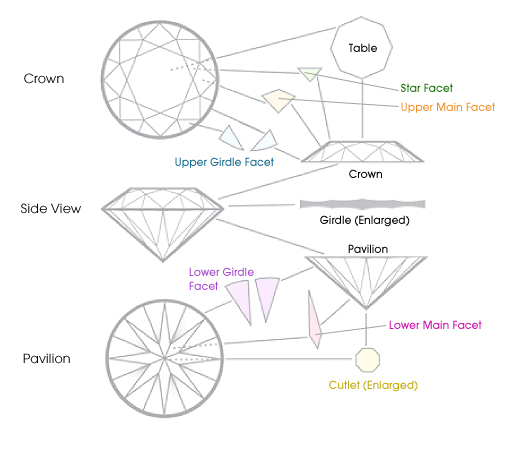 The table is the flat facet of the upper most part of the diamond. The table has a lot of influence on the brilliance and fire of the stone. Brilliance of the stone is how much light is reflected back and is usually referred to as the sparkle. The fire is the way in which the brilliance and colors of the stone vary in reflection. These two features are very important and are caused by the size of the table. If the table is too small, the diamond will lose its brilliance, but will add to its fire. If the table is too small, the diamond will lose its fire, but add to its brilliance. 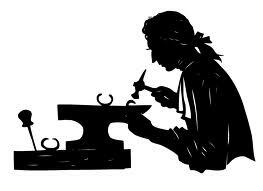 Most diamond cutters will not make the table too small, this will usually make the stone very unattractive. Depending on the cut of the diamond, will determine the size of the table, since most people find the round diamond most popular, the table size for a round diamond should be 53% and a depth of 59.3%. Knowing that the table helps determine brilliance and fire, this is important information for a diamond buyer to know. The reason why most elongated and oddly shaped stones are much cheaper, even though they may be higher in carats is due to the loss of brilliance or fire. If you are interested in purchasing a stone in the near future, consider the table of the stone and how it may affect the overall beauty of the diamond. As you are shopping. we want you to be aware, that as carat weight of a diamond increases so does the cost “per carat”, larger stones are more rare, so if a 1.00 carat diamond of a certain quality costs $6000/per carat its total cost is $6000.00, a 2.00 carat diamond of the same quality may cost $90000/per carat or $18,000.00 total. So a diamond twice as large may cost over two or more times as much. Please keep in mind, that carat may be important to those who appreciate a larger diamond, but by itself it has little to do with the quality of the gemstone. Quality diamonds can be found in all shapes and sizes regardless of the assigned carat weight and stone are graded based on how the entire gemstone looks as far as color, clarity and cut and finally carat weight. Color and clarity grades affect the price per carat in the following way: colorless with fewer inclusions are more rare and are more expensive. Compromise is often made in one or both areas. Diamonds in the colorless range are graded DEF in color and they sell for premium prices, as do diamonds that are near flawless in clarity (IF, VVS1, VVS2). 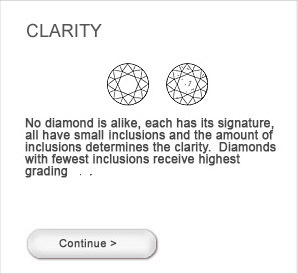 Because the differences between colorless and near colorless (GHIJ) stones and stones with minor inclusions in clarity (VS/SI) are not easily distinguishable, yet prices vary significantly, many choose a diamond in near colorless range and VS/SI clartiy range to better suit desired price range. Tips on choosing diamond color. 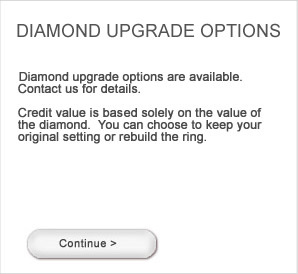 Diamond color may seem confusing to someone without experience, so picking one grade over the other can be difficult. However, diamond color is also a very individual matter - some people can immediately detect a color that is outside the colorless range (DEF), others cannot distinguish between colors several grades apart, even in controlled conditions. And while viewing the diamond is person is always best, purchasing an engagement ring diamond in the suggested range (D-E-F-G-H-I-J) is time proven to keep customers happy. Below are more detailed descriptions of color that hopefully will make the decision easier. D (colorless) - Highest quality color grade a diamond can receive. A D-color diamond is extremely rare and emits unrivaled brillance. E (colorless) - Contains minute traces of color. Also a rarity an E-rated diamond emits high level of brillanceF (colorless) - Minute traces of color can only be detected by a trained gemologist. This is a high-quality color grade. G, H (nearly colorless) - Contains noticable color only when compared to higher color grades. Appearing colorless to the untrained eye, a G or H colordiamond provides an excellent value. I, J (nearly colorless) - Contains slightly detectable color. An I-color or J-color diamond is an excellent value, as it typically appears colorless to theuntrained eye. GIA color grade scale used by jewelers. Even though there is tint in the picture below it can be hard to tell. The color can also be more a less noticable depending on how the stone is set, whether the diamond is set in white or yellow setting and whether it is closely surrounded by other stones in the mounting. Shoppers' frequent concern is that a diamond does not look yellow to the casual observer and diamonds in the near-colorless range (G-H-I-J) generally fit these criteria. 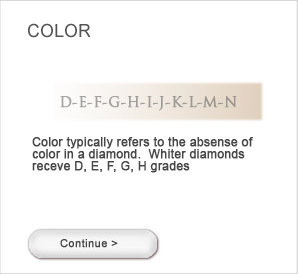 While placing a diamond D-color next to an I-color will create a differential that people can notice, I-graded diamond on its own will look basically “white” and many feel that diamonds in the G-J range, while technically not colorless, do not create an impression of color and are an excellent choice. Also, better cut diamonds may appear slightly whiter than ordinary cuts because they return more of the ambient light back to the eye and to some extent overwhelm any visible body color of the diamond itself. In choosing loose diamond clarity it is interesting to note that very few people actually buy flawless diamonds. That is because the best diamond clarity (FL) is essentially indistinguishable from diamonds several clarity grades lower and a microscope is required to tell the difference. Yet the price difference is significant. So compromise is often made when choosing clarity as well. What buyers are concerned with is imperfections that might be noticeable to the unaided eye. Inclusions are more noticable in less faceted cuts like emerald cut, or when located on the stone table, these factors need to be taken into consideration as they affect appearance of the stone. 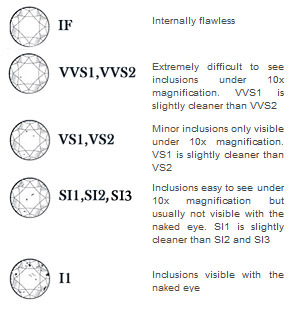 Diamond clarity is graded under ten power magnification and normally diamonds in the upper six categories (FL, IF, VVS1, VVS2, VS1 and VS2) are considered “eye clean”. Main reason to choose stones with better clarity is that presence of inclusions can sometime impact light performance, even if they cannot be seen with the unaided eye. Certain clarity characteristics especially in diamonds with SI grades can negatively impact brightness and fire. Diamond Cut is possibly the most important of the Diamond 4 C’s. The proportioning and craftsmanship of the diamond are the keys to its brilliance, fire and sparkle. Diamonds lower in color and clarity that are cut with high precision can look much more beautiful than diamonds with perfect color and clarity but faulty cut quality. "A polished diamond consists of a system of tiny facets, each one a mirror that must work in concert with all other facets in order to bring forth the full expression of the potential beauty within. No matter what size, color or clarity one may choose it is a waste of this precious potential not to maximize light performance by compromising loose diamond cut quality." As you shop, remember that diamond grading is subjective and same stone may receive different grading from the same lab no matter how austere grading procedure is. And while expert certified technical specs determine the price of the stone, we always welcome you to come in person for your personal aesthetic impression. Besides custom jewelry, diamond engagement rings or diamond bands, we welcome you to design any unique jewelry with any precious stones.